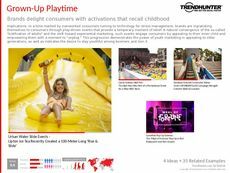 Find Better Ideas, Faster ® with a custom mom trend report, our PRO Dashboard and 80+ categories of premium trend reports. The Mom Trend Report classifies products as successfully catering to modern mothers, including products for children, relaxation and multi-tasking. Parenting apps and products are included along with leisure and fitness class innovations. Finally, we analyze mom marketing -- the advertising strategies, product packaging examples and priorities that appeal to mothers. 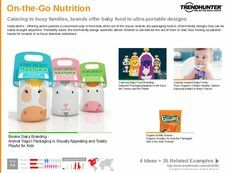 Brand marketing teams that sell parenting products as well as packaging designers for baby food or children's snacks will be interested in this report's research. Maternity fashion or product designers will also gain insights, while daycare business executives and fitness marketers can also be inspired. We cover parenting products, marketing strategies and services that appeal to modern mothers in the Mom Trend Report.